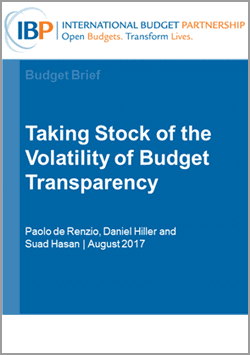 This post is based on the Budget Brief Taking Stock of the Volatility of Budget Transparency, available for download here. Undeniably, the key problem that most citizens across the world face when trying to find out what their governments do with public money is that the information they look for is simply not available to the public. Whether in China or Egypt, Venezuela or Iraq, governments make only minimal amounts of budget information publicly available, making it close to impossible for anybody to monitor how resources are raised and spent. However, this lack of transparency is not the only problem facing citizens and civil society groups interested in government budgets. Results from the International Budget Partnership’s Open Budget Survey 2015 clearly indicate that even when governments publish key budget documents, they often do so in an inconsistent and unpredictable manner. In a number of countries, Open Budget Survey (OBS) researchers found that the publication of specific budget documents could change multiple times over different rounds. For example, Fiji posted a Pre-Budget Statement on a government website in 2008 but did not release one in 2010. The government published it again in 2012 and 2015 but now has stopped producing the document altogether. In Papua New Guinea, Audit Reports are produced and published with high levels of uncertainty: the publication status of the report changed in every single round of our survey since 2008. We decided to label these frequent changes in the publication of key budget documents with the term “volatility.” Volatility poses important challenges to citizens, civil society groups, and other actors interested in budget monitoring and analysis for advocacy and accountability purposes. For them, having predictable access to budget information is essential. They need to know both where to find the fiscal data they require and when it will be published. They also need to be able to reasonably expect that the government will stick to an established publication schedule. If the publication of budget documents is not provided in a regular and timely manner, it becomes very difficult for accountability actors to effectively monitor how governments spend public resources. In order to better understand the extent – and some of the possible causes – of the volatility problem, we decided to take a proper look at how it evolved over time, and at characteristics of the countries most affected (download Taking Stock of the Volatility of Budget Transparency here). As it turns out, between 10 and 30 percent of budget documents are affected by volatility (depending on the definition adopted), a share much greater than we would expect. We then zoomed in on 34 budget documents across 26 countries that were found to be volatile according to the most stringent definition and looked for possible explanations, starting from the assumption that volatility was linked to a lack of institutionalization of budget transparency practices. In order to investigate this claim in more detail, we analyzed two datasets that help shed some light on two different aspects of institutionalization of budget transparency: 1) legal frameworks – i.e., the adoption of formalized transparency norms; and 2) government systems and capacities – i.e., institutionalization as demonstrated through established practices. Analysis of the first looked at the degree to which budget legislation, in the form of PFM Acts or similar laws across countries, includes specific provisions for the publication of budget documents and information. The second one drew on indicators included in PEFA (Public Expenditure and Financial Accountability) assessments, which measure the strength of government systems linked to the production of budget information that goes into specific documents and reports. Our findings offered no clear or satisfactory explanations of why countries may suffer from a volatility problem in budget transparency. PFM laws that include specific provisions for the publication of certain budget documents, including who should publish them and when, do seem to be associated with the regular publication of these documents, as in the case of Afghanistan’s Year-End Report or Rwanda’s Audit Report. Yet, in other cases governments have simply ignored similar legal provisions. For example, while Malawi has very specific legal provisions that require the government to publish a Pre-Budget Statement, it has not published one in any round of the Open Budget Survey since 2008. Looking at the quality of government systems, our research was hampered by the fact that PEFA assessments with relevant information (and for a relevant period) were publicly available for only 12 of the 26 countries for which we identified a volatility issue. With this caveat in mind, the available evidence shows that weak systems and lack of capacity are not necessarily constraining factors when it comes to governments publishing budget information. For most of the budget documents with irregular publication patterns, governments are perfectly able to produce the information on time, and actually do so in most cases, but decide not to publish them for reasons other than capacity. These reasons could include a failure to recognize the importance of transparency in the management of public resources, a broader lack of political willingness to ensure that the public has access to fiscal information, or weak demand for fiscal information from citizens, civil society organizations, and others. The search for explanations continues, and may require more in-depth, country-based research to explore additional domestic factors not amenable to desk-based research.